The client is a video and photo restoration service company based in the US. The client offers photo digitization, videos and movies to DVD conversion, document scanning, negative scanning, old album digitization, scrap book and slide to DVD conversion and more. 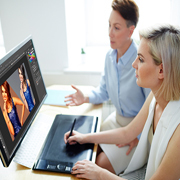 The client had a high-volume of movie strips (JPEG format), and required color correction and video creation services. They required an outsourcing partner to digitize the photos in a short time period. Photo quality differed between photos (film capture) making conversion more complex. O2I undertook a Scope of Work assessment and a quality test. During the trial, the client sent O2I seven hundred feet of film capture (photos in JPEG format), via Google Drive. The client also sent O2I the color presets and workflow via email. O2I assigned one full-time resource to complete the trial using Adobe Photoshop and Adobe Premiere Pro. The trial was successfully completed within five business hours. Based on the success of the trial, the client signed a full-time ongoing contract to outsource 120 hours of film (16,800 ft of film) to O2I. O2I allocated one full-time resource to handle the project and successfully completed the project within three weeks. The client was satisfied with our high-quality output and mentioned that they had received low cost processing support with faster turnarounds. Outsource2india has more than two decades of experience in the outsourcing arena including Data Management, Creative, Translation, Financial and other business services. We deliver high-quality outsourcing services at the most affordable costs. Contact us, tell us your requirement and get a free quote within one business day.